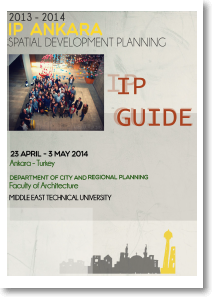 As in the previous year, the study area for this IP was the metropolitan area of Ankara. 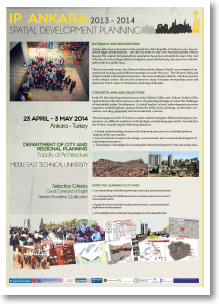 The title of the IP was ‘Sustainable urban regeneration strategies in a major metropolitan area between East and West: The Dikmen Valley and Ulus Historic District in Ankara, Turkey’. Participants were 4th-5th year undergraduate, master level or Ph.D. students in the fields of city and regional planning, urban design, architecture, conservation, urban sociology, urban and regional economics, urban and regional geography and environmental science. Criteria for the selection of students at the home institution included English proficiency, academic merits and individual motivation, in order to maximize the learning impact of the IP. They were divided in 7 topic teams, taking care to ensure national and disciplinary diversity within each group. Four of the groups worked on the Citadel and three on the Dikmen Valley.